Nothing unwinds you like taking a siesta outdoors on a beautiful summer afternoon. Just allow your clientele to enjoy our Open Air Lifestyles, LLC Commercial Teak Patio Chaise Lounges and give in to leisurely comfort like never before. Recline the adjustable back just the way you want to enjoy maximum lumbar support or wheel it to the shade if you want a respite from the sun. Soothingly comfortable even without cushions, you can also add a Sunbrella fabric lounge cushion if you'd prefer one. There are many fabric choices to choose from, customize to meet all of your resort deck requirements. 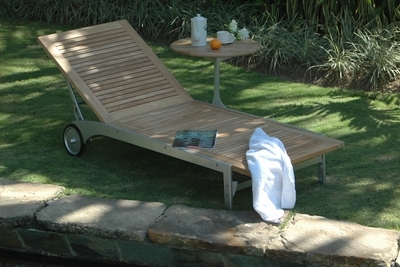 Constructed of durable Grade A Plantation teak with precise wood joints and stainless steel hardware, our chaise's are designed to defy the elements and keep looking like new season after season. Either a traditional design or a special lounge with a contemporary twist, the Open Air Lifestyles, LLC teak commercial chaise lounge makes a great addition to your patio, poolside, or hotel. About Teak Teak wood is universally recognized for its quality, durability, and beauty. Teak is a very hard, densely grained wood with high oil content. The unique combination of these characteristics makes teak naturally resistant to moisture, rot, warping, shrinking, splintering, insects and fungus. It is considered the ideal wood for outdoor furniture. If left untreated, teak weathers naturally to a beautiful silver gray color. The weathering process will change the color, but the grain will still be smooth. There will be no splitting or splintering. You may treat each piece of your set with teak oil if you wish to retain the original wood color.